Are struggling to get rid of your pain? Chances are you’re doing the wrong exercises or you’re making small technique mistakes that are hurting your knees. On this page, I share the 5 patellar tendonitis exercises that thousands of my readers have already benefited from and I will show you how to do them correctly. Using these drills you can finally heal your knees, so let’s get started with the very best exercise. The best way to reduce pain from an overused patellar tendon is to release as much tension as possible from your leg muscles. Stretching may be the first thing on your mind in that regard, but for maximum effect, you need to combine stretching with self-massage of your leg muscles. Self-massage reduces tension in your legs by releasing soft-tissue restrictions in your muscles and it can be very uncomfortable. These restrictions happen when tissues that should glide freely on top of each other are stuck together. Sometimes this happens after an injury, but often it’s a consequence of too much sitting and general lack of movement. For many of my readers, self-massage of the quadriceps muscles led to an instant reduction in pain. It’s like when your stomach hurts after eating too much and the first thing you do is undo your belt buckle: instant relief! To do self-massage, you will need a foam roller or another round object you can roll on (e.g., a PVC pipe or a tennis ball). Place the roller underneath your legs and begin by rolling your calves, your hamstrings, your buttocks (the gluteal muscles), and the sides of your hip. Finally, move on to your quadriceps muscles and roll their full length. First, with your legs straight and then with your legs bent. Roll each muscle for a minute or two and relax as much as possible. Don’t hold your breath because holding your breath causes tension as it signals your body that you’re in some sort of danger. Instead, breathe slowly and deeply through your nose. In patellar tendonitis, three muscle groups commonly tend to be tight: the calves, the hamstrings, and the quadriceps muscles. These muscle cross the knee, so any excess tightness in these muscles places more tension on the knee. If you’re running and jumping with tight leg muscles, your legs are working against additional resistance and pain eventually develops. It’s like driving with your handbrake on: instead of breaking records, you’ll break your body. Running with tight leg muscles is like having the handbrake on: instead of breaking records, you’ll break your body. Before you do any stretches, you need to release all soft-tissue restrictions in the muscles you want to stretch. A muscle with knots and trigger points doesn’t like being stretched and often reacts by becoming even tighter, which we definitely don’t want. Stretching a muscle with soft-tissue restrictions is like trying to stretch a rubber band that has a knot in it: for maximum extensibility, you first have to undo the knot. We already took care of that with the earlier exercises, so now let’s move on to the stretches for patellar tendonitis. Years ago, I noticed that I had much less discomfort in my patellar tendon if I stretched my calves before basketball games. Today, I recommend calf stretches to everyone I work with because of how common tight calves are. You need to wear shoes with a solid but flexible sole for this stretch. Another way to do this stretch is by placing the balls of your feet on the curb of the street and letting your heels sink down. 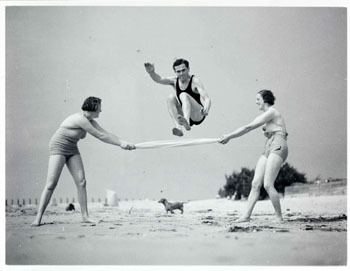 You can do this particular variation almost anywhere and I used to do it before basketball games. To stretch your quads, you will need a padded surface. I’m using a folded blanket, but you can also use a thick pillow or good kneepads. I don’t recommend doing this on a hard surface, as it’s very painful and may injure your knee. Another variation of this stretch is the couch stretch. The couch stretch also stretches your quads and you will need a couch to do it. Dr. Kelly Starrett of San Francisco Crossfit popularized this stretch. Place your knee all the way into the back corner of the couch and then sit up straight. Don’t round your lower back. Keep your abdominal muscles braced as if you’re bracing for a punch and keep the gluteal muscles of the leg you’re stretching tight. Tight hamstrings are very common today, but you have to be careful with stretching them. 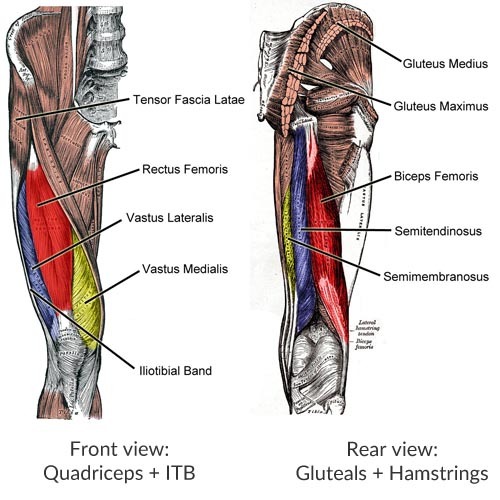 Make sure you’ve trained your gluteal muscles for at least a week or two before you stretch your hamstrings. Lie on your back and use a belt or something similar to pull one foot closer to your body. Push against the belt with your foot for 10 seconds while you pull on the belt with your hands. After 10 seconds, release the tension, breathe out with an audible sigh, and pull your foot a little closer. Do this stretch with your legs straight and with your legs bent. To understand why training your hip muscles is important for healing your patellar tendonitis remember this analogy: if you lift with good back alignment, it’s much easier on your spine than if you were to lift with a rounded back. For good leg alignment, your feet need to point forward and your knees should track over your toes when you move. Don’t let your knees cave in towards the midline of your body and don’t let your knees come forward when you jump or squat. Lie on your side with your body in a straight line. Now, raise the upper leg up by leading with the heel. Keep your hips perpendicular to the ground and never move your hip. You should feel the exertion on the outside of your hip and not your thigh. Lie on your side with your legs slightly bent and in front of you. Rotate the upper leg out, merely using your hip muscles. Don’t push off with your feet and don’t move your hip. Lie on your back and move your heels in so that your middle fingers gently touch your heels. Now, push through your heels to form a straight line from your knees to your shoulders. Touch your buttocks muscles and your hamstrings to make sure your gluteals are doing most of the work. To help you get back to being active the way you love, I’ve create a free email course on patellar tendonitis and I also want to send you the two most important chapters of my book Beating Patellar Tendonitis as a gift. Click here to receive my best material on patellar tendonitis. Lastly, if you know someone with patellar tendonitis, help them get rid of this frustrating injury by sharing the link to this page. I can’t reach everyone myself, so I appreciate your help!